Whenever you have to cook for a special occasion, you always want your food to taste and look good. A mandoline slicer can cut your fruits and vegetables into clean, almost-perfect slices giving your table the appearance that makes a meal memorable. But, if you’re going to buy one there are a few aspects you have to take into account. 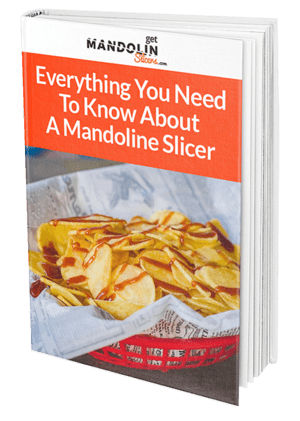 Owning a mandoline slicer usually requires a lot of care because they have small, intricate parts, so you have to be careful not to damage it or injure yourself when cleaning it out. Keep in mind you also have to make sure you buy one that has a design focused on safety and functionality. Because it boasts numerous features and a durable design, we believe the OXO Steel Chef's Mandoline Slicer could be the best options for your kitchen. This mandoline slicer has a wide range of different cut options available that result in different thicknesses. These specialized slicers can help you prepare many different types of plates while adding a touch of class to your meal presentation. 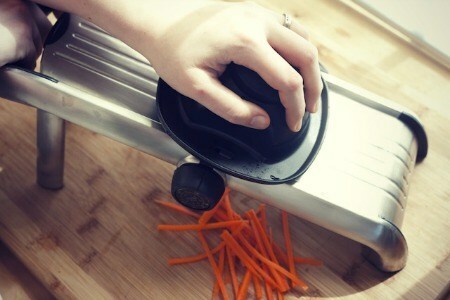 The OXO Mandoline Slicer also comes with rubberized feet that prevent sliding. The rubber allows for the slicer to sit firmly in its position, giving it amazing stability when in use. The legs on the OXO fold for storage so you can fit it comfortably in your pantry or counter. 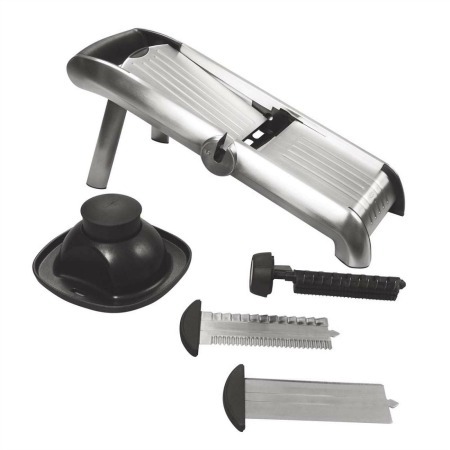 The design of this mandoline slicer not only make it very easy to use, but they also allow you to clean it more easily, making it an all-around great choice for most kitchens. 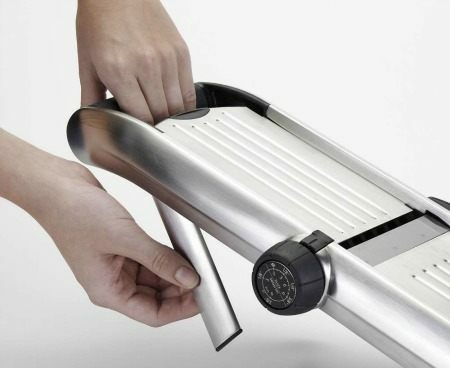 As we mentioned above, a lot of people are praising the overall design for the OXO Mandoline Slicer. Many reviews rave about the fact that you can save the blades in a separate storage case, which helps you keep your kitchen in order. Some folks appreciated the fact that the instructions were detailed and easy to follow. This helped them learn how to use the slicer really quickly. Other reviews also mentioned how the body and food holder were easy to wash. Both are dishwasher safe, so you don’t even need to worry about hand cleaning it and potentially cutting your fingers! Some reviews did point out the fact that there are a few setbacks that might complicate your experience with this slicer. Sometimes the blades can be a little complicated to attach to this OXO model, but given that the design itself is secure you just have to be a little patient when you’re changing them. Other reviews complained about the fact that the slicer can take a while to assemble, but if you follow the instructives your are sure to get it right eventually. The best choice if you want to purchase the OXO Steel Mandoline Slicer is Amazon. Aside from being extremely reasonably priced at just under $100, you’ll benefit from shipping straight to your doorstep no matter where you are in the world. 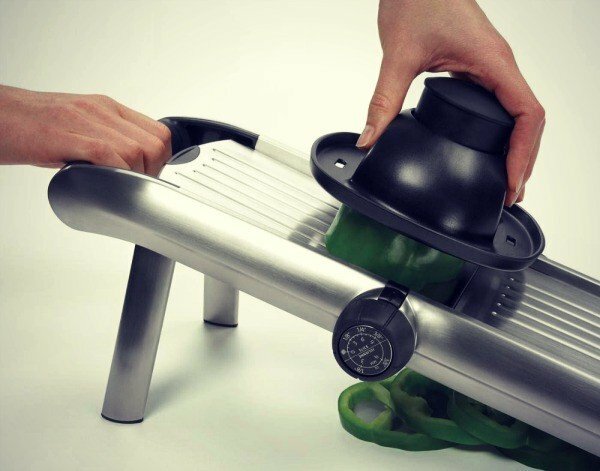 The OXO Steel Mandoline Slicer can get the job done when you want to cook that special meal for your family or friends. In addition to offering an unmatched level of quality and attention to detail, it will enhance your cooking experience, a key reason why it has earned our stamp of approval.